Ok folks so where are you? Probably tucked up in bed, at least those in Blighty. Whilst the support crew are up and at ’em at 4am, fumbling for the light switch and the tooth brush to be bright and breezy for when the guys are ready to leave. Bring on the coffee and don’t tell them we may well grab a few 40 winks after they head off up into the mountains! 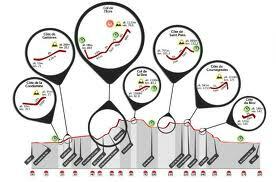 In 24 hours the Support team with have escorted the competitors to the beach, distracting the nerves. Tony and Dan will have lined up with over 2000 other insane nutters, Considering the best method to cover the 2 or 3 meters of very uncomfortable stones and launch themselves into the waves to commence a race of a life time. The walk back from the Pasta Fest last night covered topics such as the metal boredom of straight road run, the merits of setting a time goal for each stage vs being delighted just to complete it and the issues over pre-race preparation involving the bathroom! The 5k walk, rather than waiting for the hot and overcrowded bus was an opportunity to calculate the view around the bay that will appear on each of the three circuits, and the hope that there will be as little wind as possible to battle with. The guys talk of flick flacking between nerves and excitement and the desire to just get it started now. 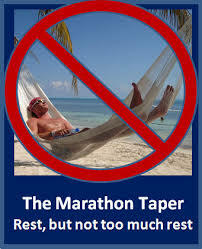 But in reality the last day of essential training involves doing very little, and resting, perhaps taking in the rugby, but definitely feet up, until they announce, “perhaps a little swim in the morning would be a good idea, oh and a small run later on” But for now it is a question of mental calm and biding the time to the start. It is not clear where the live results are to be posted online, if we find out we will pass the information on through a blog post. But the start is 6:30am, remember Nice is a hour ahead, so obviously we hope everyone will be up bright and early at 5:30 to be thinking of them at their start line. 7:30-7:50 they hope to be exiting the swim., hopefully fending off any kicks to important parts of the body, and dodging the jelly fish. The race is not possible to view en route unless you are residing in one of the mountain villages as lots of roads are closed and the thought of taking a car or taxi up to station yourself to see them wizz past but increase the chances of being the cause of a collision with a competitor in some freak accident is not worth it. So after thy have done the journey they will return to the seafront. It is thought anytime from between 2 to 4pm local time. Then the run, four times up and down the Promenade de Anglais. Support crew on hand if required, mainly in full voice to cheer as loudly as possible, and post any and all news as live as possible. Expected finish time, nothing firm and no expectations, but vaguely any time between between 7 and 9pm, But we will keep you posted. So another season over and another trophy in the cabinet…not too shabby. Oh and another manager destined for the scrap heap ! 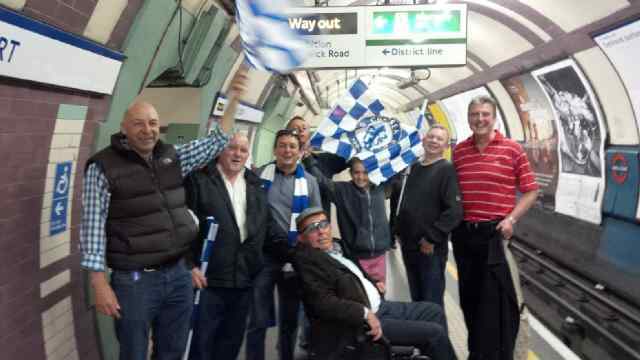 Our final pilgrimage to the Bridge saw us visit the Prince of Wales, our normal drinking hole before games, so armed with wheelchair, the boys from Baldock managed to get Colin there in one piece. As Helen said, how he has done it I just don’t know. After the excursion to Amsterdam, where we went a straight 24 hours before ending up in Colin’s room at 3.30am on the Thursday morning, (having won the Europa Cup) eating all the sandwiches Helen had made along the way, grabbing about five hours sleep and then back on it, well just amazing. Yesterday saw us end the season in third place beating off our London rivals and securing Champions league for next season…more European fun, in fact we are already looking at the Prague trip in August for the Super Cup against the Germans. 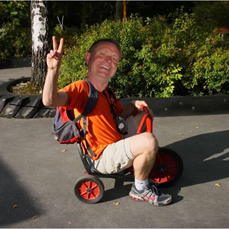 Special mention to Bootsie (head carer) what a job he has done, take a bow !!!!! So now we have a break however fund raising is still in full swing, we have the Insurance night on Thursday: Lloyd’s The Musical, and the famous waxing this weekend. We have also enlisted four guys who are going to do the three peaks in July and adding their funds to our cause….great stuff. Finally, and now that the money is on the JG site I felt I must point out to Faye and the girls that whilst their event and total was amazing it wasn’t quite up to the boys total !!!! Not that this is a competition (much), but with the Photograph money raised on the night we raised over £1300, I’m sure as you said Faye ‘girls should be running the world’ but let’s keep the finances with the boys ! Oh Joy, but what a view! 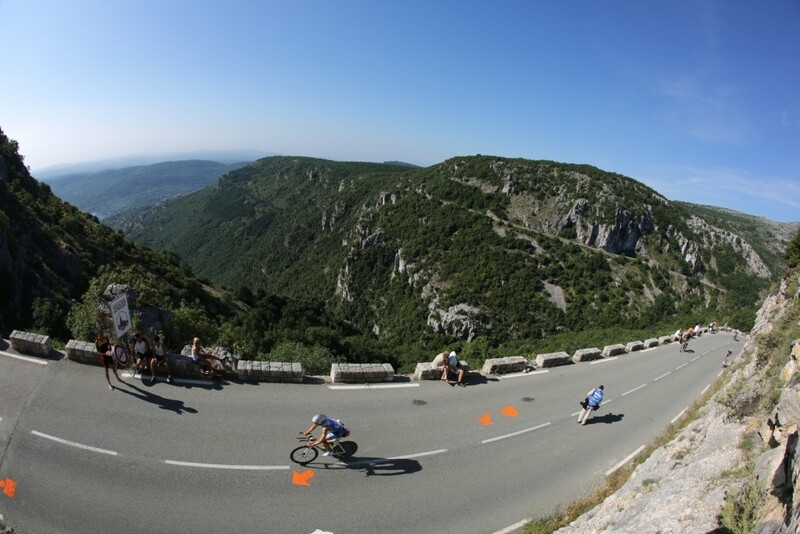 At the 62nd kilometer of the bike course, you will pass near the village of Gourdon. One of the most beautiful villages of France and medieval fortress, Gourdon overlooks leafy “Vallée du Loup”. From Victoria Square, listed in 1940, a breathtaking panorama unfolds over 80 kilometers of coast revealing the Mediterranean, from Nice to Théoule ! On the road of flavors and scents, the village retains an authentic charm with its Romanesque church of the twelfth century.. Yer right sure we will feel like popping into the Church !! At the heart of, the bustling streets, the houses of Provence, many craftsmen and the quality of its hospitality make it one of the most popular places in the area. One half of Team IMHeadcase is out of Surgery, not just a keyhole, a more invasive procedure due to the discovery that the damage was greater than expected. The code reads L sh ASD, E\O ACjt Cuffrepair- subscap, supraspin LHB tenddesis, for those in the know! for those of us mere mortals it is replacing ligament into shoulder blade, two rotator cuff tear repairs, shaved collarbone where chipped and whilst in there shaved off a bit of arthritis. But what will it mean going forward? Firstly tying shoelaces is to be challenging. Pre tied ties hanging on the door and slip on shoes, sleeping sitting up and no driving. Of course the latest fashion accessory – a fetching blue sling with accompanying stabilising pad for 6 weeks. 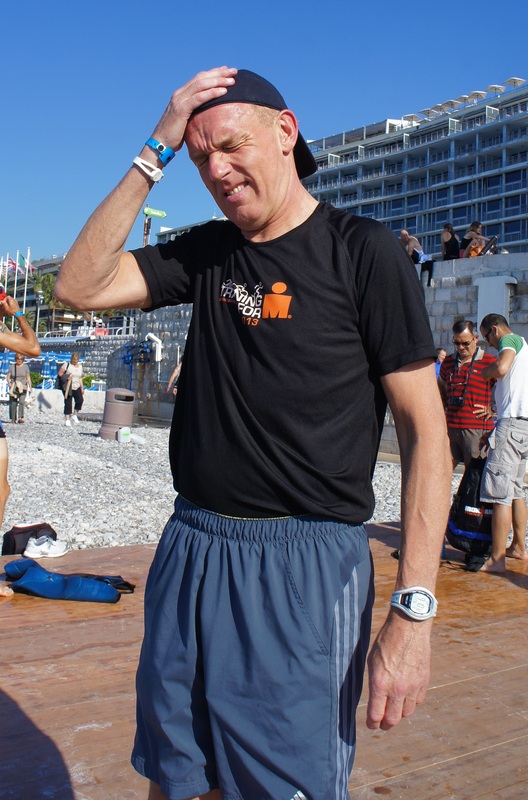 However the training must go on at some kind of level – so a sneaky 12k the day after and stepped up to 20k the day after although no use of the arm makes for the legs taking the strain and being a little lopsided. 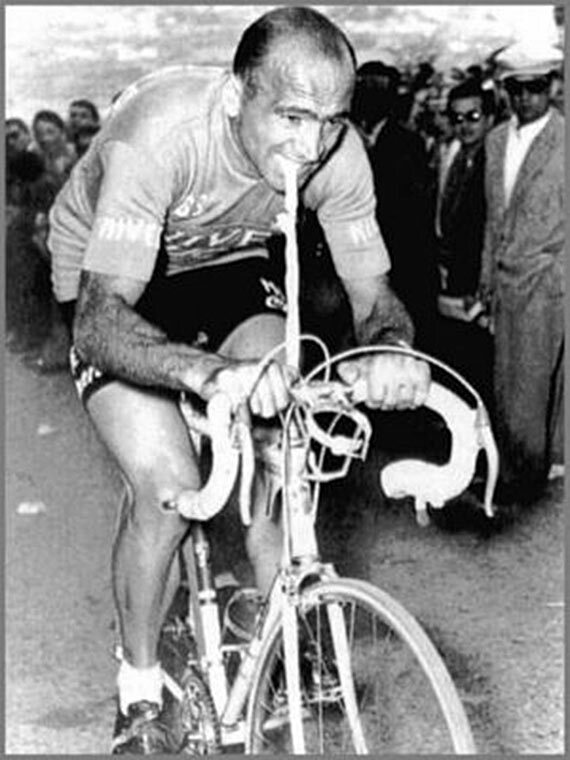 Taking some inspirational thought from Fiorenzo Magni, cyclist of the 50’s who broke his clavical in the 1956 Giro d’Italia, but with the help of a bicycle inner tube strapped around the handle bar and held in his teeth he fought through a snow storm, and went on to complete the race and finish 2nd. So 6 weeks of sling wearing, and gentle cycling is the order of the day, assuming getting dressed can be mastered first! Then gloves are off and the slog to build up the long lack of swimming and running to prepare to complete the course within the allotted time. The severity of the operation makes the race seem a log way off. 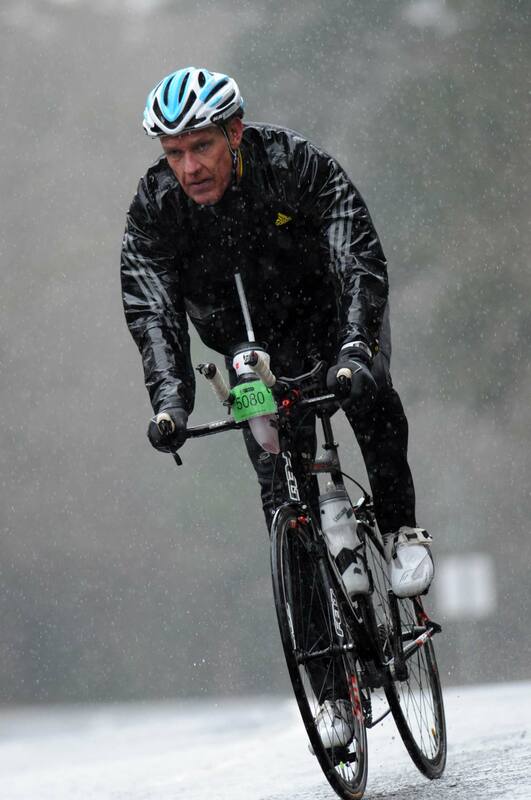 None of this is a jot on the landscape compared to Colin’s situation, but his wishes are to raise the money and that means the journey continues but with him in our thoughts with every pedal strike.